Still in Escrow but subject to cancellation. Bring me a strong offer & let's talk. Great property that's priced to sell! 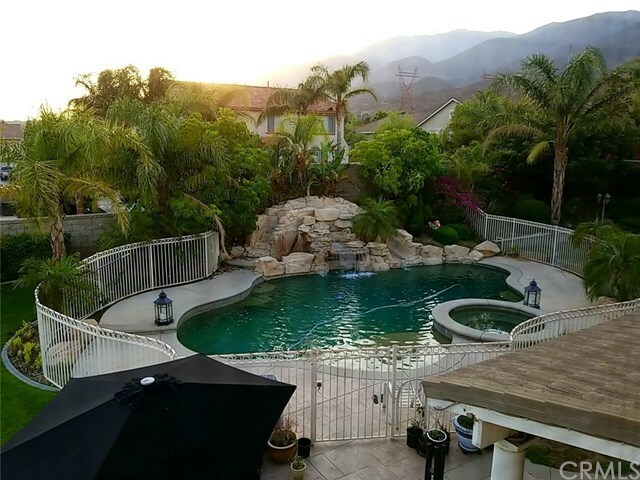 This Large Sheridan Estate Home located in the hills of North Rancho Cucamonga is perfect. This home has 3,744 Sq Ft living space & sits on almost 1/2 an acre. Large families will love the 5 big bedrooms, 3.5 bathrooms & 2 offices. Entertainers will love the 20 ft long tiled patio cover, built in gas BBQ island & stamped concrete. Everyone loves the teal green color of the Salt Water 42 ft Rock Theme Swimming Pool that features a Stunning Waterfall, Water slide, Spa & 5 ft "Beach Front" entry that's great for children . The property faces East & is 1 mile South of the Ling Yen Mountain Buddhist Temple. In the prestigious Etiwanda/Chaffey School District, Children will attend Etiwanda High School, Summit Intermediate & Etiwanda Colony Elementary. There are 4 BR's upstairs & 1 BR downstairs. Master BR has 2 walk-in closets, Large Master Bath has spa tub, very large kitchen has granite center island, counters & splash, tile floors, crown molding, 6" baseboards, ceiling fans in every room, laundry room, formal dining area, 3 car garage, garage has drop down ladder & space for extra storage. Back of property is enclosed by 6 ft Cedar Block Wall. 10 ft iron gate opens to side yard for RV/Car/Boat parking, custom trash enclosure, Double Door Front Entry, & much more!